Malacca has always been our go-to place for a short getaway. Most of the time, it's been without the kids. We love soaking in the ambience of Jonker Street and strolling by the river. Of course, the food never fails to draw us back to this laidback town with its sleepy atmosphere. The facade of Malacca has, however, changed over the years. Imposing mega malls loom over two-storey shophouses. 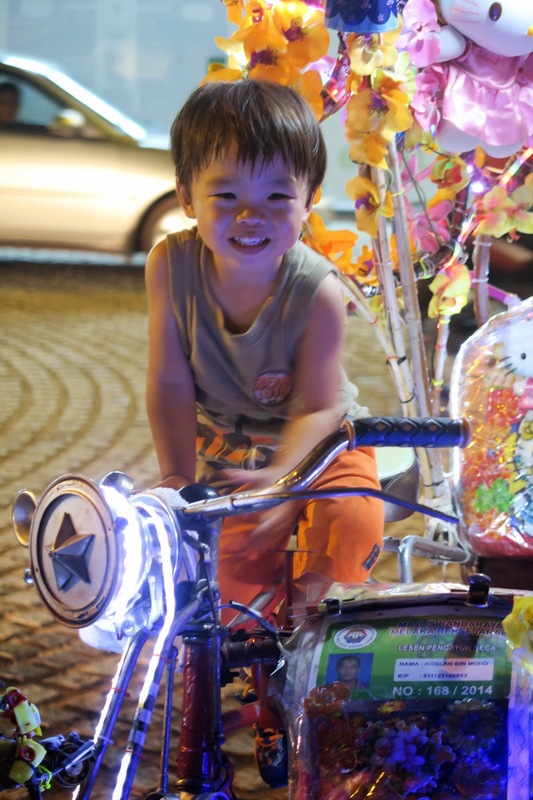 I would probably have not brought the boys along as the streets are narrow and traffic seemingly never ebbing, but when I googled "Malacca for Kids" this time round, there were quite a few options for the kids to enjoy. Of course, the main reason why we decided to go was because we were attending my dearest cousin's wedding dinner. And our choice of accommodation was largely influenced by the water play area which our hotel had. We have to admit that was the main reason we chose Swiss Garden Hotel and Residences. It turned out to be a fairly new hotel built next to The Shore, a new shopping and residential complex. The rooms were comfortable and spacious, and at what we felt was a good rate with breakfast included. Amazing - a hotel with a complete water play area! This is my must-eat place everytime I go back. Serves lunch-time starting 11am, everyday except Sunday. Finishes by 2pm. Walk to Jalan Bunga Raya. (You'll have to walk because parking is almost impossible here). 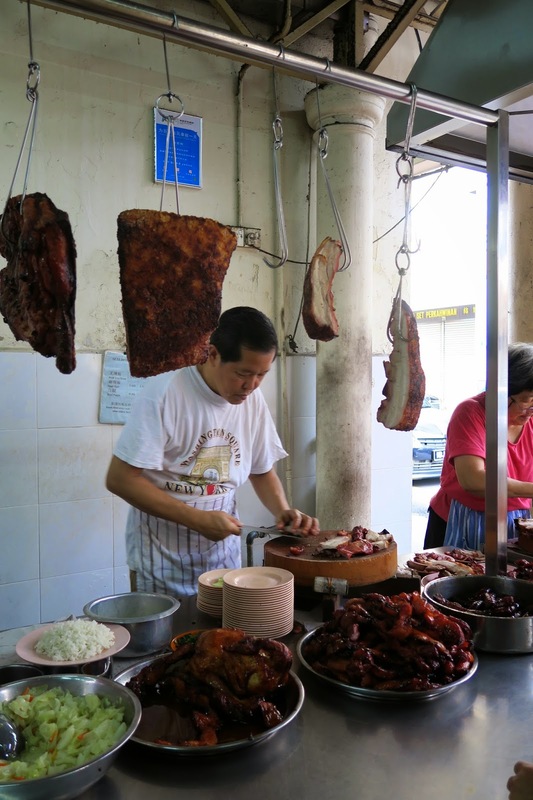 You will come along a side alley (on the right hand side of the traffic flow) which has been paved for three char siew stalls and a few other yong tau foo & porridge stalls. You know you're in the right place when at the front is a sugar cane drink stall. The stalls that you want is the two stalls nearest to the main street. The right hand stall serves their char siew in dark sweetish-savoury sauce. This is good for a pure Char siew experience. The left hand stall serves it with Chinese curry. 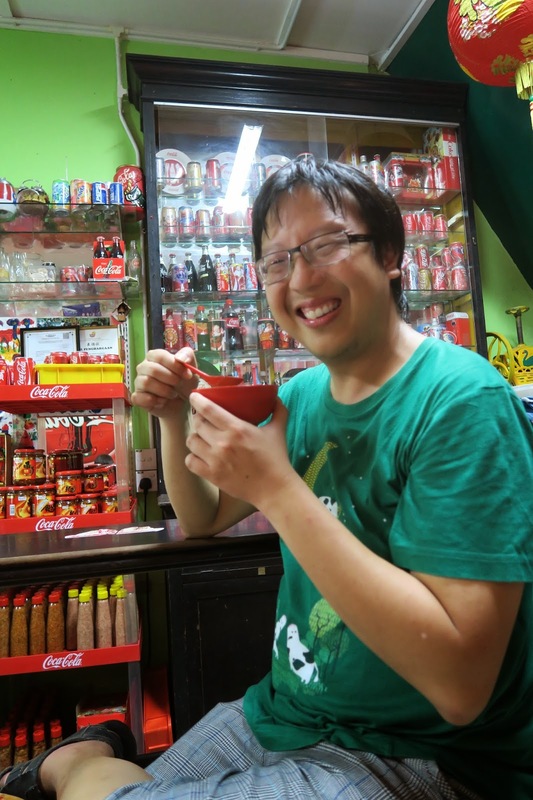 They have a better variety of food to accompany the char siew, especially their omelette and Siew Yok. And I love their sambal, it's quite unique. There is a third stall further in that also serves Char siew, but their only specialty is their sweet-and-sour pork which I also feel is world class, but it's not something impossible to find elsewhere. What I have never found elsewhere which only the first front two stalls serve is the Char siew pun fei sau. You have to specifically ask for that, if not sometimes they just serve you the 'ordinary' lean Char siew. You can ask for extra plates of Char Siew pun fei sau. Trust us, it's worth finding. Just as Danny said. Note the sugar cane stall in front. This stall was further in. We found the char siew leaner and enjoyed the sides, especially the cabbage. The first stall. Char siew with a toasty burnt flavour, served with a deep sweetish sauce. So much flavour! The char siew pun fei sau. Impossible to find anywhere else! Madam Kim's popiah - on the same row as the char siew stall. Outside Madam King's Department Store. Each spring roll is prepared with much care. The queue grows long at mid day, so try to be there at about 11.30 am at least. 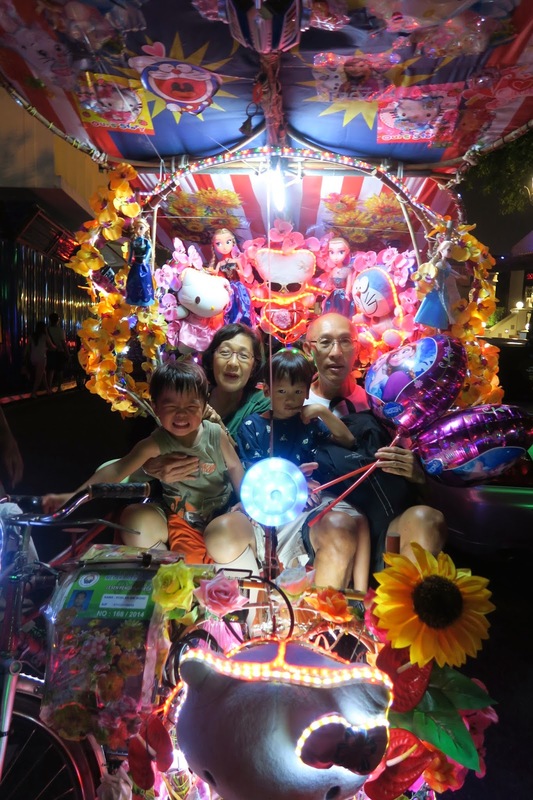 In the evening, we decided to take a boat ride down the Malacca River and to give the boys a chance for a trishaw ride. We set off on the boardwalk outside our hotel, but realised that we had to take a taxi to the docking point at the other end of the river, nearer to Jonker Street. You can find more information about the river cruise here. Always up for a walk in the outdoors! Scenes of Kampung Morten in Meleka, a well-preserved living museum - a traditional Malay village which offers homestays. Off we go! The little one was thrilled as he has been pestering me for a boat ride for the longest time. The older boy was happy too! It is "lemak" enough and with plenty of gula meleka. Yummy! 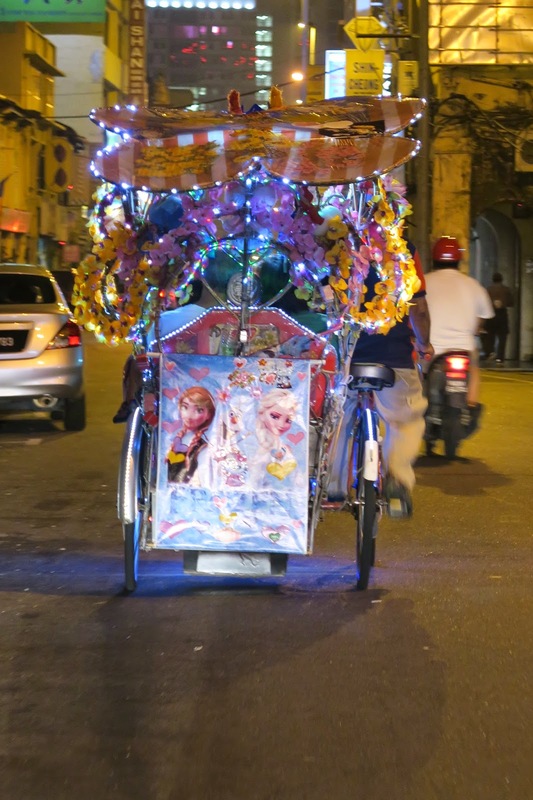 Of course, no evening in Meleka is complete with a ride on one of these crazily decorated trishaws! This one had a "rojak" theme - a little bit of everything! Our trishaw driver wanna-be. Very pleased with himself. We ended the last day with our current favourite chicken rice ball shop in Malacca - The Ee Ji Ban Chicken Rice Ball Shop! The balls are still handmade in this shop and the chicken is flavourful. 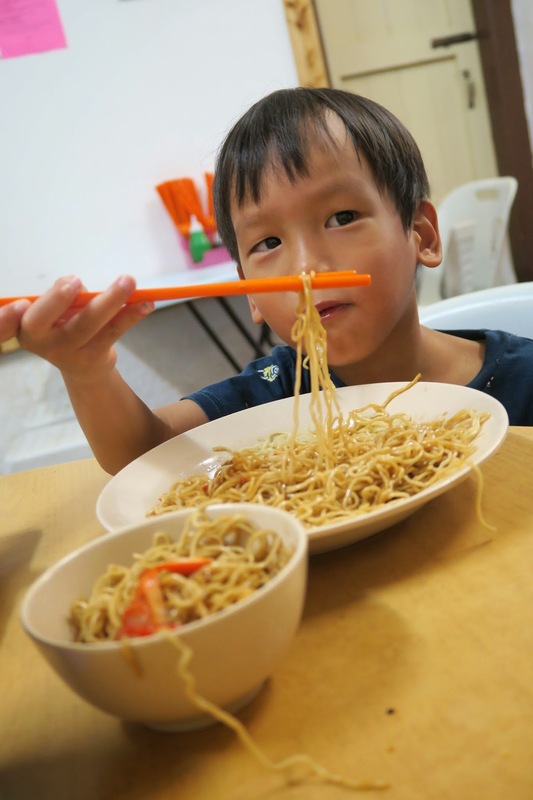 The other nonya dishes complete the meal!